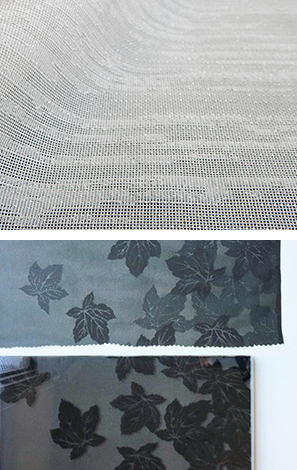 A kind of the summer kimono silk textile called “Mon sha” is a semi-tansparent texture that has softly misty effect with woven design patterns.Now its width has become to be 1,200mm that is the exclusive ITOKO’s weaver made product of silk “Mon sha” in Japan. 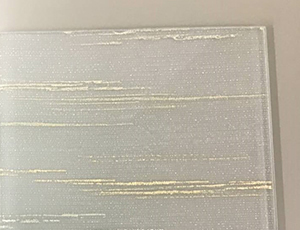 This translucent textile can be dyed with Kimono dyeing techniques of gradually changing colors and hues from dark to bright depending on the cutomers’ preference. 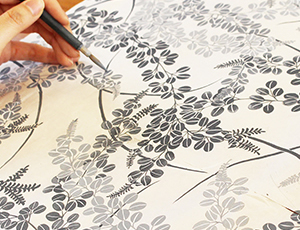 And our Gold leafing hand-drawing techniques can be also infused with the intersecting lines of woven design. 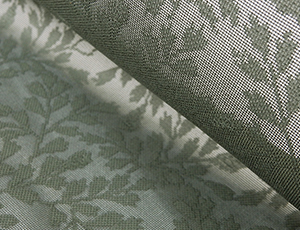 According to customer ‘s request , we wil l propo se a new pattern to our designer. 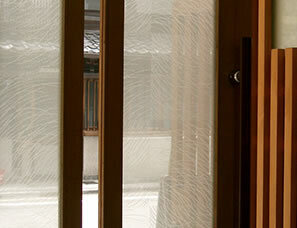 Bringing in designs and arranging existing patterns are also possible. Gold leaf craftsmanship is a superior Kimono technique which is represented as a traditional Japanese art. Gold leaf art on silk fabric, laminated between glasses, provides the precious glassdoors and partitions of modern elegance. Kimono craftworkers will dyed one by one with a brush. Bespoke custom colors as well as gradation dyed etc. are also possible.